Normally, Andrej Shevchenko and his team at the Max Planck Institute of Molecular Cell Biology and Genetics in Dresden analyse proteins and fats in the cells of fruit flies or roundworms. In this case, however, the scientists dealt with some very unusual samples: misshapen fragments that turned out to be the remnants of cheese from the Early Bronze Age, making them the earliest known cheese yet to be discovered. The cheese fragments represent funerary goods that were found around the neck and on the chest of a 4,000-year-old mummified body uncovered at the Xiaohe burial site in Xinjiang, western China. Their analysis enabled the researchers to recreate the recipe for the cheese: like kefir, it was made of milk with the addition of a mixture of bacteria and yeast, and subsequently fermented. The 4,000-year-old Xiaohe cheese represents the oldest remains of a milk product ever found. The extremely arid climate in the Taklamakan Desert, where the Xiaohe burial ground is located, meant that the cheese residues were exceptionally well preserved – a real stroke of luck for the Dresden-based researchers. 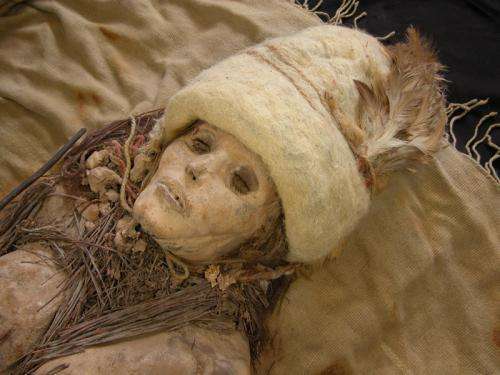 The cheese found on the mummies was produced with bacteria and yeast, not with rennet: "This meant that no young animals had to be slaughtered – a major advantage of this production method," explains Shevchenko. According to the scientist's interpretation, this may have been instrumental in the spread of cattle herding on a large scale throughout Asia. "The method of making this kefir cheese is simple; it doesn't spoil or turn rancid quickly – so the cheese is extremely well suited to mass production." As a precursor to the cheese, the process of fermentation with kefir grains also produces the probiotic milk drink known as kefir. Both products contain hardly any lactose – ideal for the population groups living in Asia, most of which are lactose intolerant. Andrej Shevchenko's wife Anna heads the Mass Spectrometry Department at the same Institute. The two researchers have only recently completed another archaeology project and published their findings. In her desk drawer, Anna Shevchenko still has a few plastic tubes filled with light-brown crumbs – 2,500-year-old funerary goods found during excavations at the ancient Chinese burial ground of Subeixi. "In that project, too, we analysed protein residues from an earthenware dish and were able to reconstruct a prehistoric recipe for leavened bread," she relates. "We never actually had archaeology on our radar screen. We just kind of stumbled across it thanks to an e-mail enquiry sent by Chinese archaeologist Yimin Yang," says Shevchenko. Yang had come up with the idea of having his finds analysed with ultramodern quantitative proteomics methods, whereupon he sent the scientists in Dresden the first cheese fragments. Before they could proceed, they had to develop methods of identifying proteins from organisms whose DNA had not yet been sequenced. The projects are therefore truly pioneering and demonstrate most notably that quantitative proteomics is not only suitable for use in biomedical research, but could also represent a promising method for archaeology: "The analytical methods used in archaeology to date always looked at DNA or fats – yet these are often totally useless, especially when it comes to very old organic samples. Proteins have been ignored so far because it was always believed that they would be completely decomposed, that they're difficult to handle and that the results might be contaminated with proteins from the ambient environment. So our method opens up brand new possibilities for the analysis of organic residues on archaeological finds," says Anna Shevchenko. Unlike fats, proteins carry a great deal of information inside them in molecular form: for instance, the arrangement of amino acids, the building blocks of the proteins, can also contain signs of the processes used, like fermentation. As such, proteomics could develop into an interesting and suitable method in archaeometry.